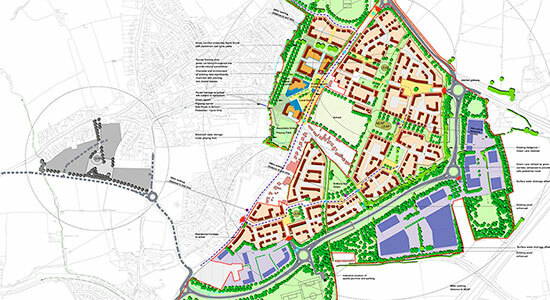 A residential scheme of 900 dwellings and employment uses on green field land with a new A38 link road diversion to facilitate connectivity of the new and existing settlement. We undertook masterplanning with the team, detailed traffic analysis for inclusion in the Transport Assessment, the transport section of the Environmental Statement, safe routes to school appraisal and a Travel Plan. The scheme included detailed liaison and negotiations with local highway authorities and Highways Agency. Post outline planning permission, we assisted developers of individual phases to discharge planning conditions.